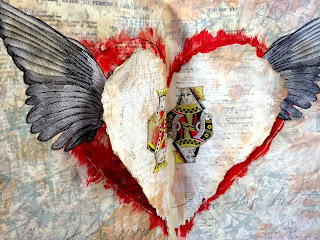 I recently began runnin' around with a new altered book club over at one of my favorite stores in town- Paper Crown. We meet the last Wednesday of every month. I had a great time at the first night, last January 30. I had such a great time, that I can't wait 'til 27FEB! At the class/club/whatever we're calling it, we each brought an old book. We passed our books to the left. We took the other person's book home and 'did a page.' When we return, we'll pass our books again and continue. I can't wait to see all the things that people will do to my book! First of all- if you're one of the fun people from the class- DON'T READ further! Or look at any pictures. You'll see it all on the 27th. Okay? 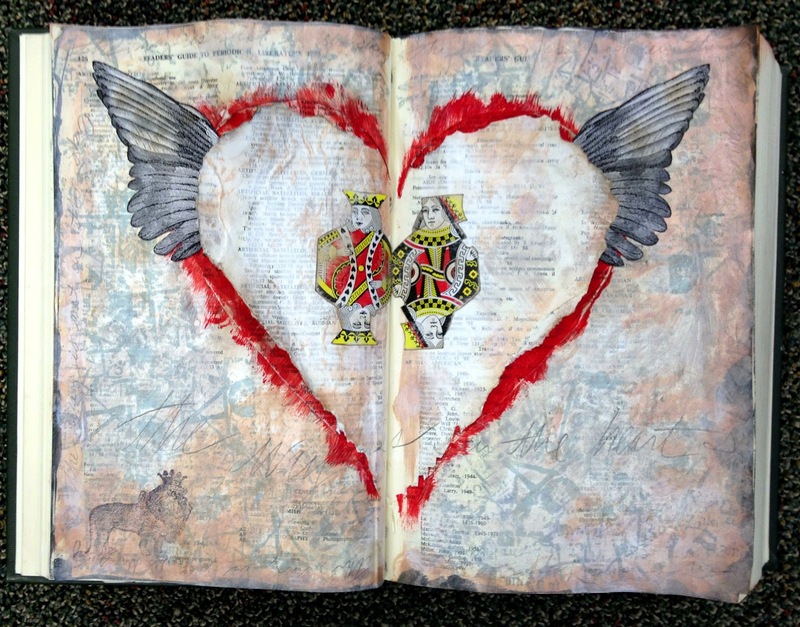 An altered book is a book that you alter in some way and/or many ways. No, I'm not being smart. You just....alter it. With paint. Or collage. Or saliva. Or however. Usually all of the above. I love the look and feel of an old book. And a worthless old book (yes, they exist) that's been painting and glued and filled with interesting things- well, it's amazing. And I had so much fun doing the page in the other person's book, I had to grab another old book and start a private/personal one, all for myself. There is lots of stamping going on up there... First, I 'glued' a few pages together on each side with gesso AND painted over the pages with more gesso. 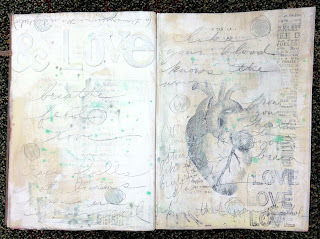 I used the Kaisercraft 'Graffiti' stamp all over the page, stamped at alternating angles, to cover the pages. Then some more randomly smeared gesso on top. I cut the heart shape in the center out, except for a center hinge. I painted the pages behind the cut pages with red paint. Which, as pretty as red is, tends to always look like splattered blood. I glued on a cut-out King and Queen of Hearts from a deck of Dollar Tree playing cards (I'm not ruining my classy deck of cards from Tiffany's on an altered book. Not yet, anyways.) and stamped a crowned lion (from the dollar bin at Michaels) in the bottom left corner. I found the wings at The Graphics Fairy. If you aren't obsessed with the Graphics Fairy, I don't know what's wrong with you. There's a close-up on the crowned lion stamp. Ain't he cool? You can also see some of my random Distress Stain and penciled handwriting. There's a final shot, sideways- hoping it would show off the 3D aspect of the heart, folding out of the pages. I don't think you can see in any of the shots, but I used some metallic Distress Stain to 'gild' the edges of my layout. Dangit. Since I went with such a monochromatic look, here, you can't make out most of it... 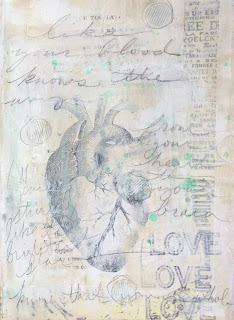 I finally had an excuse to use my new Tim Holtz WORD PLAY die, to cut 'and love' from some chipboard. 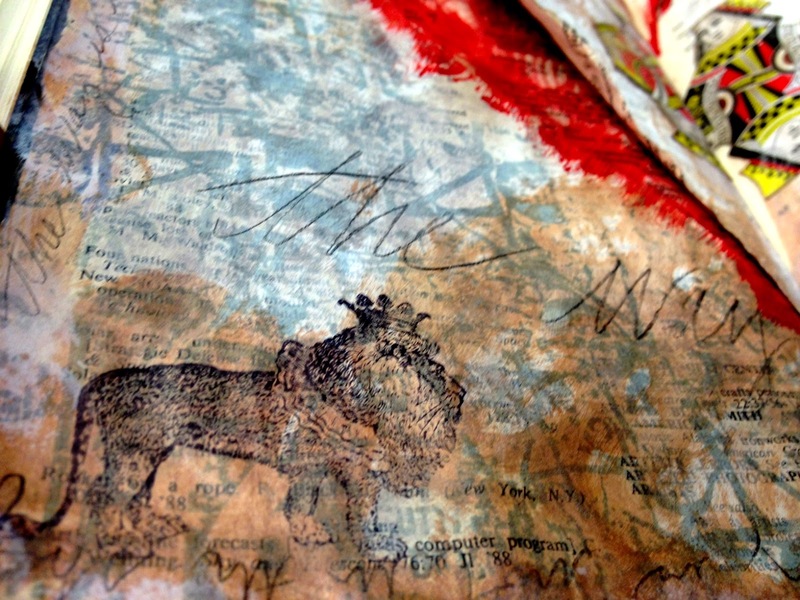 There's some Mister Huey's splattered over my white and beige painted pages. The heart is another freakin' cool find from The Graphics Fairy, and the penciled handwriting is lyrics from one of my favorite songs (Midnight Radio) from one of my favorite musicals (Hedwig And The Angry Inch). The 'LOVE' stamp is from the dollar bin at JoAnn. You can see some of Mr. Holtz's tissue tape peeking out on the right, there, too. 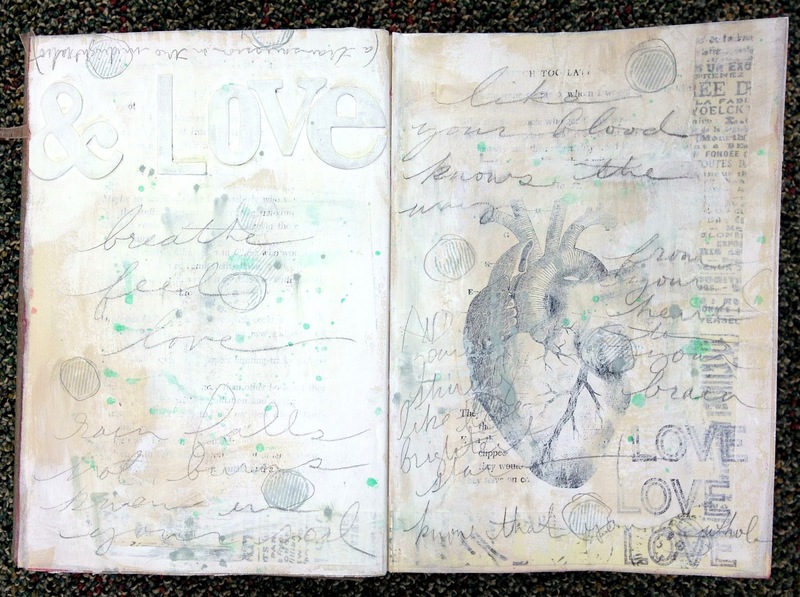 Have any of you altered a book or art journaled? Show me! I'd love to see! 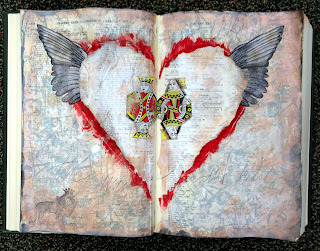 Cool journal page. Especially that last photo where you can see the 3-D effect. And I did not know about The Graphics Fairy. I'm already in love. Thanks for sharing! Cool very interesting love the heart with the wings probably my favorite. I didn't know about The Graphics Fairy, have to check them out. There a reason why I come on to your page. I find other interesting art and artists that for sure. Hope your day going well it wet and rainy here. Most of the snow is melting away. what a great class/club to be a part of...love your pages! This is amazing! I want to do one now!!! :) Makes me want to move to OKC so I have other people to craft out with. I have one I'm working on now as well. It's my art journal for the year. Hi Kory,did you know you can make faux washi tape, with 'tracing paper'? You can cut it to printer size and just print out your design on it, and then cut it in strips. It is very effective, and much cheaper than washi!